Going by unfolding events and the imminent danger of attack by Fulani terror herdsmen in the South East and South South, it has become imperative for concerned citizens to compel Gov. Dave Umahi, Ifeanyi Ugwuanyi, Okezie Ikpeazu, Rochas Okorocha, Willie Obiano and Ohaneze Ndigbo to reverse their public proscription of IPOB or else they will be held responsible for any major herdsmen attack anywhere in the South East or other parts of Biafraland. We are hereby placing all Biafran ethnic nationalities on record, especially the Igbos, that the criminal conspiracy to proscribe IPOB by South East governors in collaboration with Ohaneze Ndigbo was hatched to aid the Fulani invasion and conquest of Igboland. Under heavy pressure from the Fulani caliphate in mid-2017, Igbo governors along with Nnia Nwodo and Ohaneze Ndigbo executive conspired to leave Ala-Igbo defenseless by their treacherous proscription of IPOB. 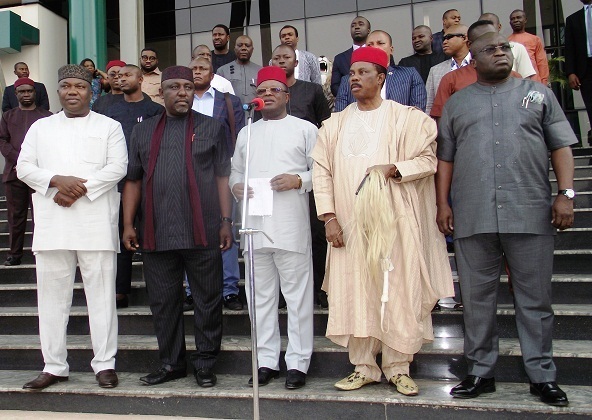 By proscribing IPOB and aiding the indiscriminate arrest, torture, murder and detention of IPOB family members at the hands of Fulani law enforcement officers, these Igbo governors working alongside Ohaneze Ndigbo literally sacrificed Igboland and the lives of thousands of Igbo people to the marauding herdsmen. They not only opened the door for the invaders to come in, they knowingly aided the slaughter of hundreds if not thousands of innocent people in their quest to please their Fulani masters. Interestingly enough, the same Arewa leaders that prevailed upon Igbo governors and Ohaneze Ndigbo to proscribe IPOB have so far refused to proscribe their own Fulani terror herdsmen that are doing the killings in the South East, Middle Belt and other parts of Southern Nigeria. How perverse is that? How is it possible that seemingly reasonable and apparently educated Igbo leaders could be persuaded by their northern counterparts to proscribe, ban and fight IPOB that are the only people capable of defeating Fulani herdsmen, when the same northern leaders have repeatedly failed to offer mere verbal condemnation of the atrocities of their all conquering herdsmen? One is forced to ask, where are the brains of these Igbo leaders. Definitely these are not the type of people that will defend Igboland in times of crisis such as now. They are too cowardly, compromised, materialistic and will not hesitate to hand over Igboland to Fulani jihadists as long as they retain their political power, patronage and wealth. They are infinitely incapable of confronting this common threat to our existence. Before the murderous invasion of the home of our leader Mazi Nnamdi Kanu in Isiama Afaraukwu on the 14th of September 2017 by Nigerian soldiers acting on the instructions of South East governors and Ohaneze Ndigbo, it was common knowledge that the menace of Fulani terrorists were a distant memory. IPOB quietly and effectively checkmated their activities across the length and breadth of Biafraland. We repelled the terrorists and stopped them in their tracks in Delta and Enugu State on six separate occasions without fanfare. That there weren't any Fulani terror herdsmen attacks throughout the period our leader was touring Biafraland was down to the excellent work IPOB did in our communities to keep it safe from herdsmen attacks. Since the invasion of our leader's home and his abduction by Nigerian soldiers, followed by the hasty and illegal proscription of IPOB by Igbo governors and Ohaneze Ndigbo, Fulani herdsmen has been emboldened to attack outlying villages with impunity. The most distressing aspect of it is that these governors have no solution to curb the menace. There has been more than four reported attacks in Ebonyi State alone in recent times to which Gov. Dave Umahi have appeared impotent to do anything about. Instead he is advocating for the establishment of Fulani cattle colonies in Ebonyi State all because he wants to be a Vice Presidential candidate to a northerner. The blame for any Fulani invasion of any part of Biafraland must be laid squarely at the doorstep of South East Governors Forum and Ohaneze Ndigbo. Dikenaasaa, ekelekweem gi. Otu ubochi agam abia kwee gi na aka, ebe obula i no.